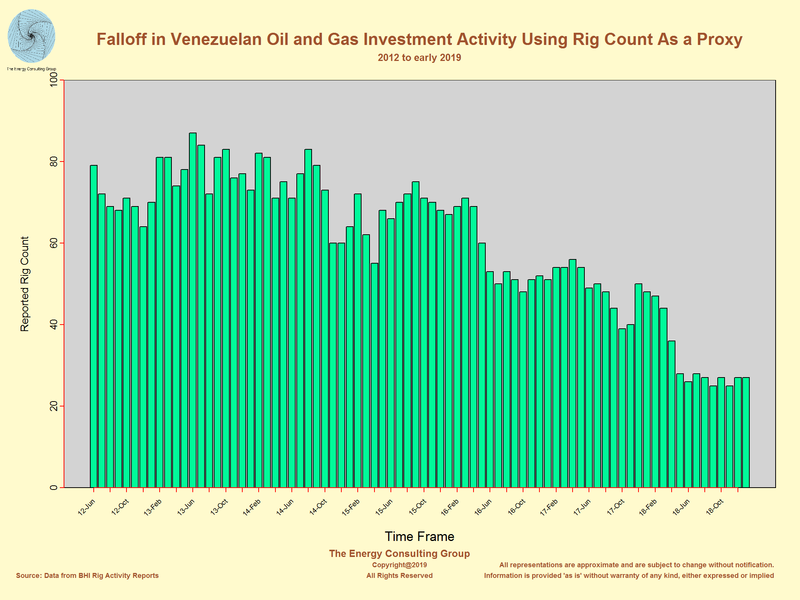 A sharp falloff in investment, as shown by the decline in the rig count, led to the pull back in Venezuelan oil production. These links take you to rotable, zoomable, roamable 3D versions of the above elevation, relief map. These are quick loading. Controls: to rotate use the left mouse button, to zoom in/out use the mouse wheel, and to roam use the right mouse button. Online map controls: to rotate use the left mouse button, to zoom in/out use the mouse wheel, and to roam use the right mouse button. 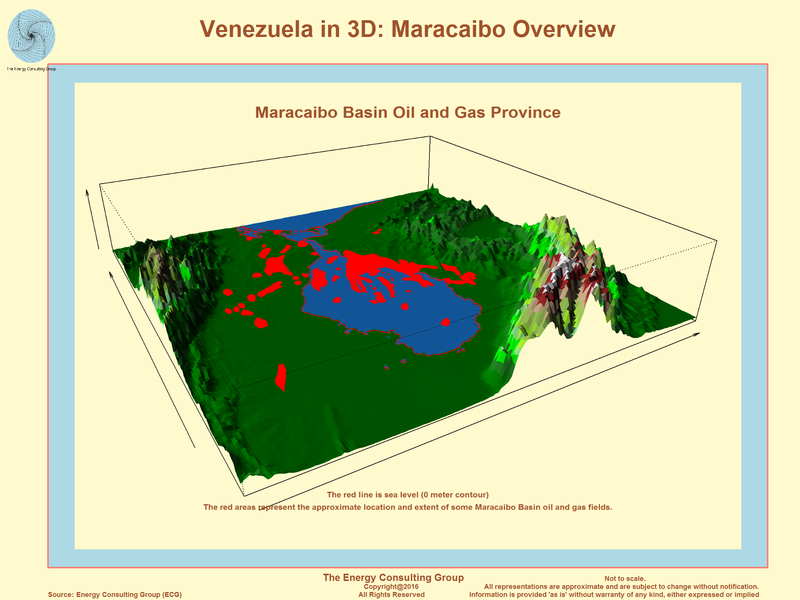 The following panel contains an interactive 3d map of the Maracaibo oil and gas basin in Venezuela. It is intended to help provide geographic context for the important oil and gas producing region in Venezuela. 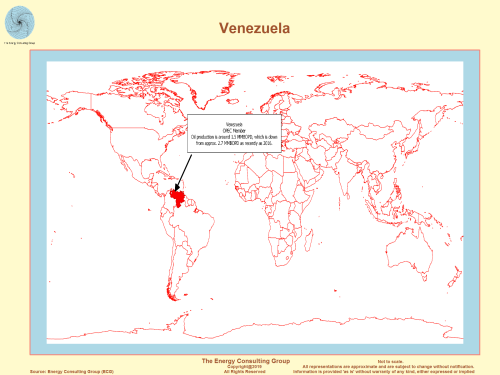 Venezuela is one of the world’s largest producers and exporters of crude oil. It has consistently been one of the largest exporters of crude oil in the Americas. As a founding member of the Organization of the Petroleum Exporting Countries (OPEC), Venezuela is an important player in the global oil market. While production has been declining, Venezuela exports of crude oil to the United States have been among the top. In recent years, through significant upfront investment, an increasing share of Venezuela’s exports have been delivered to China and India. 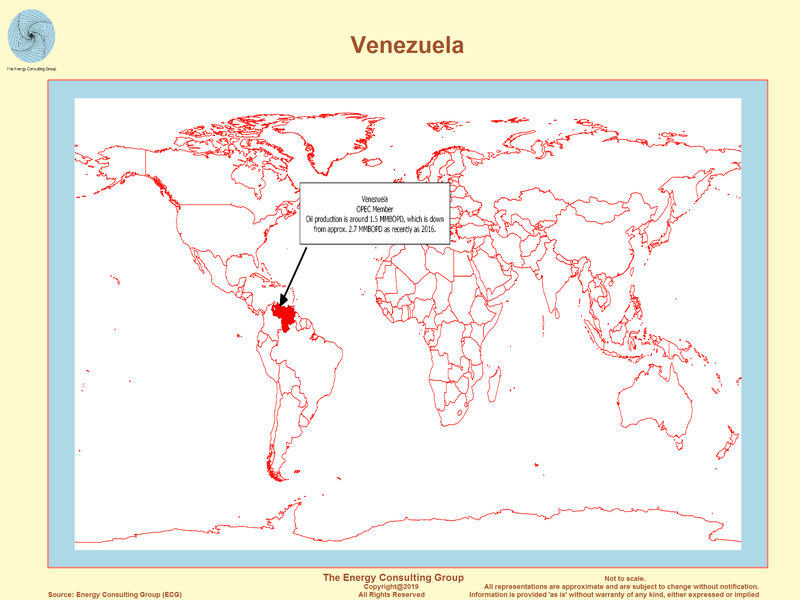 In 2012, Venezuela consumed 3.3 quadrillion British thermal units (Btu) of total energy. 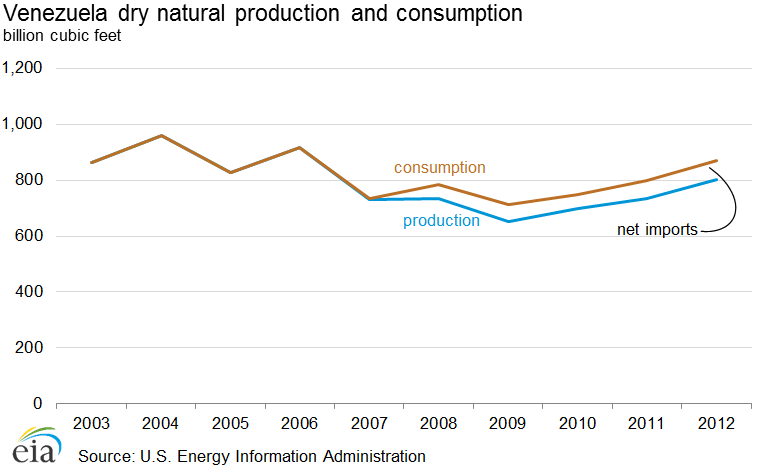 Oil continues to represent the majority of total energy consumed, while use of natural gas has increased in the past five years. Hydroelectric power represents less than 25% of total consumption, and coal represents less than 1%. Venezuela was the world’s 9th largest exporter and 12th largest producer of petroleum and other liquids in 2013. According to the Oil & Gas Journal (OGJ), in the beginning of 2014, Venezuela had nearly 298 billion barrels of proved oil reserves, the largest in the world. 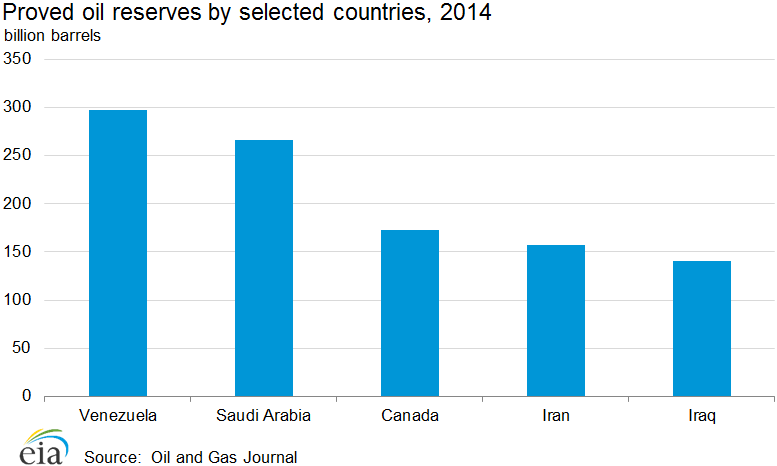 The next largest proved oil reserves are in Saudi Arabia (266 billion barrels) and Canada (173 billion barrels). 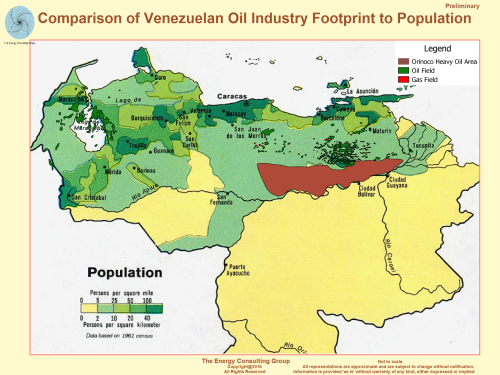 The vast majority of Venezuela’s proved oil reserves are located in its Orinoco heavy oil belt. Venezuela nationalized its oil industry in the 1970s, creating Petroleos de Venezuela S.A. (PDVSA), the country’s state-run oil and natural gas company. Along with being Venezuela's largest employer, PDVSA accounts for a significant share of the country's gross domestic product (GDP), government revenue, and export earnings. During the 1990s, Venezuela took steps to liberalize the petroleum sector. 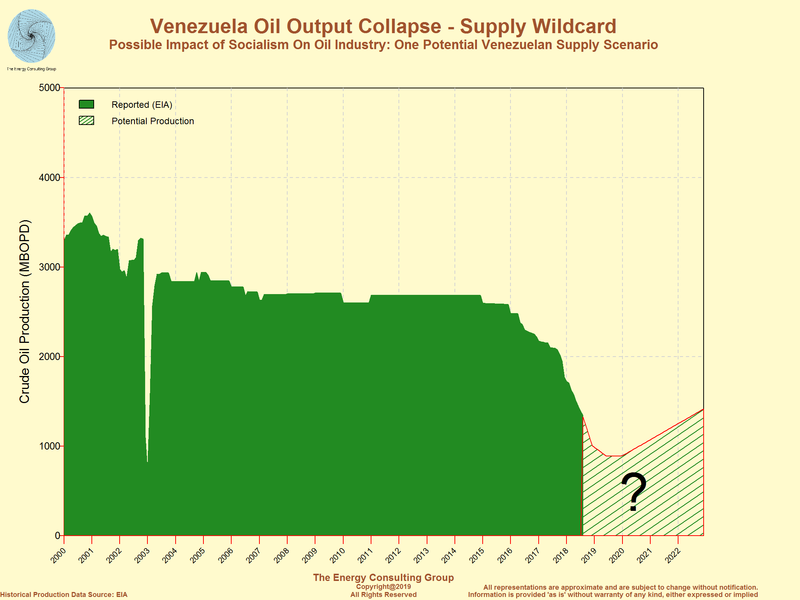 However, since the election of Hugo Chavez in 1999, Venezuela has increased public participation in the oil industry. The Chavez government initially raised tax and royalty rates on new and existing projects and mandated majority PDVSA ownership of all oil projects. In 2002, nearly half of PDVSA’s employees walked off the job in protest against the rule of then-President Chavez, largely bringing the company’s operations to a halt. In the wake of the strike, PDVSA fired 18,000 workers and overhauled the internal organization to solidify government control. The loss in human capital has never been entirely recovered, resulting in a loss of technical capabilities affecting PDVSA’s overall production levels. In 2006, Chavez implemented the nationalization of oil exploration and production in Venezuela, mandating a renegotiation of a 60% minimum PDVSA share in projects. Sixteen firms, including Chevron, ExxonMobil, and Royal Dutch Shell, complied with new agreements, while Total and Eni were forcibly taken over. After Chavez’s death in 2013, President Maduro continued Chavez’s policies. Venezuela is also increasing pressure on foreign operators that remain in the country to increase investment to offset recent production declines. At 2.49 million barrels per day (bbl/d) of petroleum and other liquids produced in 2013, Venezuela is the world’s 12th largest producer and the 5th largest producer in the Americas. 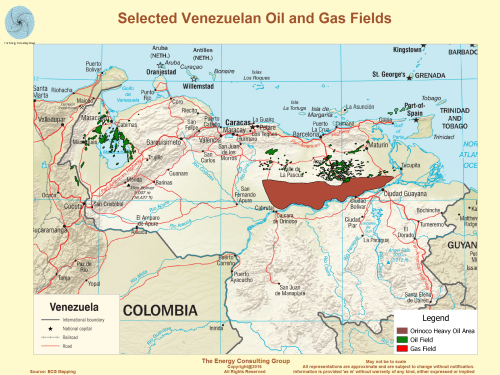 The U.S. Energy Information Administration (EIA) estimates that Venezuela produced 2.49 million barrels per day (bbl/d) of petroleum and other liquids in 2013. Crude oil and condensates represented 2.2 million bbl/d of the total, with condensates, natural gas liquids, and refinery processing gains accounting for the remaining production. This production level marks a significant decrease from production peaks in the late 1990s to early 2000s, largely owing to human capital losses from the 2002-03 strike and the diversion of revenues to social programs to bolster the administration rather than being reinvested into petroleum production. Despite its declines and lack of reinvestment, Venezuela is still one of the largest producers of petroleum in the world. In 2013, Venezuela was the fifth largest producer in the Americas, behind the United States, Canada, Mexico, and Brazil. Estimates of Venezuelan production vary from source to source, partly because of the measurement methodology. For instance, some analysts directly count the extra-heavy oil produced in Venezuela’s Orinoco Belt as part of Venezuela’s crude oil production. Others (including EIA) count it as upgraded syncrude, whose volume is about 10% lower than that of the original extra-heavy feedstock. Venezuela’s conventional crude oil is heavy and sour by international standards. As a result, much of Venezuela’s oil production must go to specialized domestic and international refineries. The country’s most prolific production area is the Maracaibo basin, which contains slightly less than half of Venezuela’s oil production. 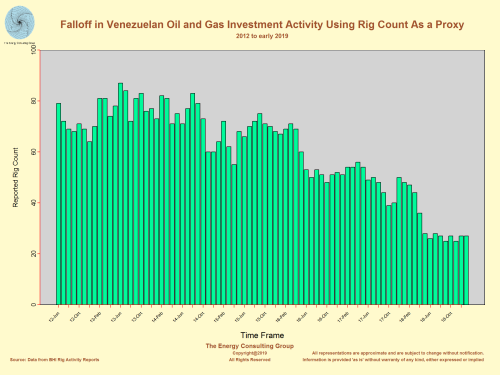 Many of Venezuela's fields are mature, requiring large investments to maintain current capacity. Venezuela’s Orinoco Belt may contain upwards of 513 billion barrels of crude oil. However, much of the resource is heavy and requires additional capital to bring it to market. Venezuela contains billions of barrels in extra-heavy crude oil and bitumen deposits, most of which are situated in the Orinoco Belt in central Venezuela. According to a study released by the U.S. Geological Survey, the mean estimate of recoverable oil resources from the Orinoco Belt is 513 billion barrels of crude oil. PDVSA began the Magna Reserva project in 2005, which involved dividing the Orinoco region into four major areas that are further divided into 28 blocks, and then quantifying the reserves in place. This initiative resulted in the upgrading of Venezuelan proven reserve estimates by more than 100 billion barrels. In the 1990s, Venezuela’s PDVSA established four strategic associations with international oil companies to exploit these resources. After the implementation of the nationalization policy in 2006, these strategic associations led by ConocoPhillips, ExxonMobil, and Total became newly formed mixed companies led by PDVSA holding majority shares. The nationalization resulted in the exit of ConocoPhillips and ExxonMobil, as they were unable to accept PDVSA taking majority shares. The Magna Reserva projects involve converting the extra heavy crude and bitumen to lighter, sweeter crude, known as syncrude. The upgrading facilities themselves introduce another element of risk into Venezuela’s petroleum supply chain. While the country’s four upgraders have installed production capacity of about 600,000 bbl/d of syncrude, industry estimates place production levels for these facilities at less than 500,000 bbl/d as a result of maintenance and safety issues. 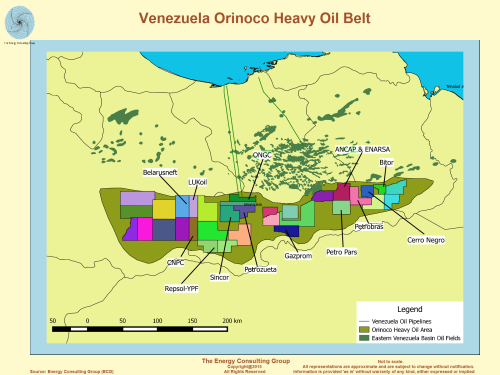 Venezuela plans to further develop the Orinoco Belt oil resources in the coming years. In 2009, Venezuela signed bilateral agreements for the development of four major blocks in the Junin area. In 2011, the country awarded two more major development licenses in the Carabobo region. Venezuela expects these projects to add more than 2 million bbl/d of heavy oil production capacity by the end of the decade. However, given recent financial, regulatory, and operational issues, considerable uncertainty surrounds the future of Orinoco production. 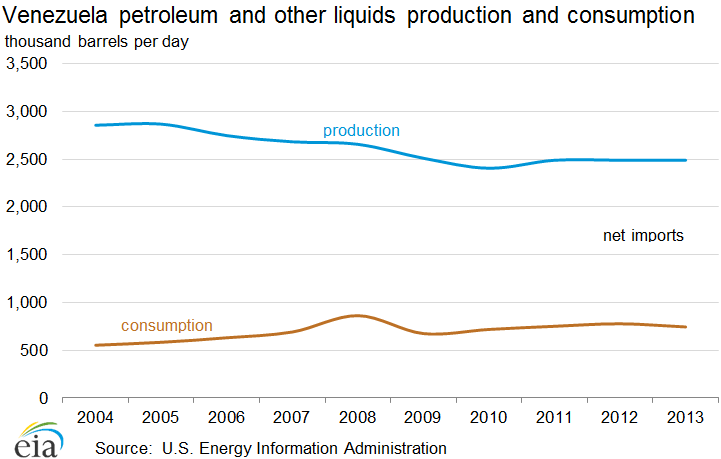 Venezuela was the fourth-largest supplier of imported crude oil and petroleum products to the United States in 2013. However, Venezuela’s exports to the United States have been declining while U.S. exports of petroleum products to Venezuela have been increasing. EIA estimates that in 2013 net exports from Venezuela totaled nearly 1.7 million bbl/d of crude oil and petroleum products, a significant decrease since the peak of 3.1 million bbl/d in 1997. Venezuela sends a large share of its oil exports to the United States because of the proximity and the operation of sophisticated U.S. Gulf Coast refineries specifically designed to handle heavy Venezuelan crude. In 2013, Venezuela was the fourth-largest supplier of imported crude oil and petroleum products to the United States behind Canada, Saudi Arabia, and Mexico. U.S. imports from Venezuela have been on an overall decline in recent years. In 2013, the United States imported 797,000 bbl/d of crude oil and petroleum products from Venezuela, a decline of 49% from a decade ago. 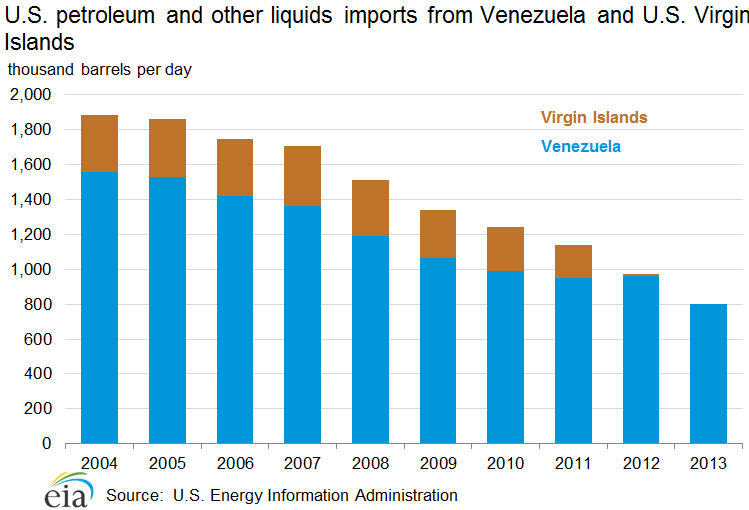 In prior years, U.S. imports from the U.S. Virgin Islands were calculated as imported volumes from Venezuela because the petroleum products produced were almost exclusively refined from Venezuelan crude. However, since the U.S. Virgin Island’s Hovensa refinery was shutdown in 2012, the U.S. Virgin Islands no longer exports refined Venezuelan petroleum. 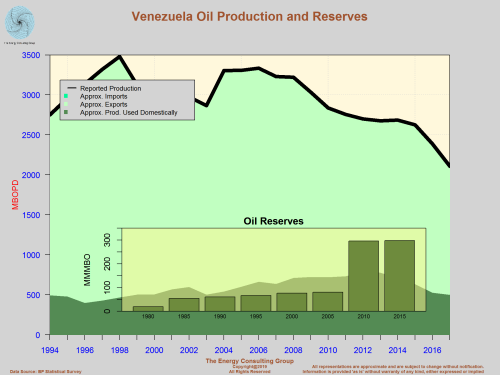 While U.S. imports of primarily crude oil from Venezuela have been on the decline, U.S. exports of petroleum products to Venezuela have increased largely because of Venezuela’s tight finances that leave it unable to invest and maintain its own domestic refineries. A decade ago, the United States exported 7,000 bbl/d to Venezuela; in 2013, the United States sent Venezuela 84,000 bbl/d of petroleum products in 2013, primarily methyl tertiary butyl ether (MTBE), intended for blending in gasoline, motor gasoline, and distillate fuel oil. Although the United States receives the bulk of Venezuela’s exports, other important destinations of Venezuelan petroleum exports include the Caribbean, Asia, and Europe. Two of the fastest growing destinations of Venezuelan crude oil exports have been China and India. EIA estimates that Venezuela sent more than 260,000 bbl/d of crude oil to China and more than 400,000 bbl/d to India in 2013. Venezuela provides a sizable amount of crude oil and refined products to its regional neighbors. Under the Petrocaribe initiative, Venezuela provides crude oil and refined products to many countries in the Caribbean and Central America, offering favorable financing and long repayment terms that often feature barter arrangements instead of cash transactions. In addition, Venezuela has a separate supply agreement with Cuba. According to industry reports, these preferential supply agreements amount to more than 400,000 bbl/d of Venezuelan exports. Although Venezuela publicly maintains that Petrocaribe will not dissolve, many analysts believe, given the financial circumstances of PDVSA, shrinking foreign exchange reserves, and exports guaranteed to other countries, that Venezuela will have to redefine the terms offered under Petrocaribe. 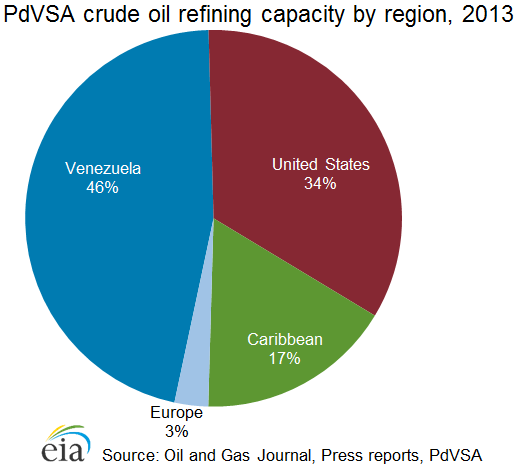 Venezuela maintained 2.8 million bbl/d of total global refining capacity in assets throughout the United States, the Caribbean, Europe, and domestically in Venezuela in 2013. According to OGJ, Venezuela had 1.3 million bbl/d of domestic crude oil refining capacity in 2013, all operated by PDVSA. The major facilities include the Paraguana Refining Center (955,000 bbl/d), Puerto de la Cruz (195,000 bbl/d), El Palito (126,900 bbl/d), and San Roque (5,200 bbl/d). While capacity remains largely unchanged, the throughput from these refineries has suffered because of the lack of investment to maintain the facilities. This problem was highlighted by the Amuay refinery fire in August 2012 that left more than 40 people dead, and disabled some of Venezuelaâ€™s refining throughput at the Paraguana Refining Center. Through PDVSA and its subsidiary CITGO, Venezuela also controls significant refining capacity outside the country, giving it a total global refining capacity of 2.8 million bbl/d. The largest share of Venezuela’s global downstream operations is in the United States, followed by significant operations in the Caribbean and stakes in Europe. CITGO, a wholly-owned subsidiary of PDVSA, operates three refineries (Lake Charles, Louisiana; Corpus Christi, Texas; Lemont, Illinois), with a combined crude oil distillation capacity of 755,400 bbl/d. CITGO’s gulf coast refineries source most of their crude oil with PDVSA under long-term supply contracts. PDVSA also owns a 50% stake in the 189,000-bbl/d Chalmette facility in Louisiana. In 2009, ConocoPhillips exercised the option to purchase PDVSA’s share of their refinery in Sweeny, Texas. This move, coupled with Venezuela’s sale of its equity stake in Germany’s Ruhr Oel GmbH to Rosneft, constituted a substantial contraction of Venezuela’s net global capacity. In addition, PDVSA announced a desire to sell its stake in its European assets, but the country has yet to do so. Minor equity acquisitions in the Caribbean have partially offset this change. Domestically, Venezuela plans to add new capacity of more than 400,000 bbl/d by 2020. Notable planned global refinery builds include a 400,000 bbl/d joint venture with PetroChina in Guandong province, China; a 300,000 bbl/d joint venture with Petroecuador in Manabi, Ecuador; and a 230,000 bbl/d joint venture with Petrobras in northeastern Brazil. In light of the ongoing currency and liquidity issues, many of these and other announced projects have been delayed or are on hold. 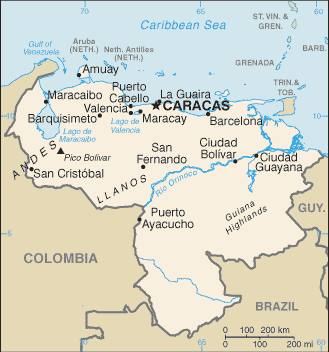 Venezuela has the second-largest natural gas reserves in the Americas, behind the United States. Much of the natural gas is used to bolster production in its mature oil fields. 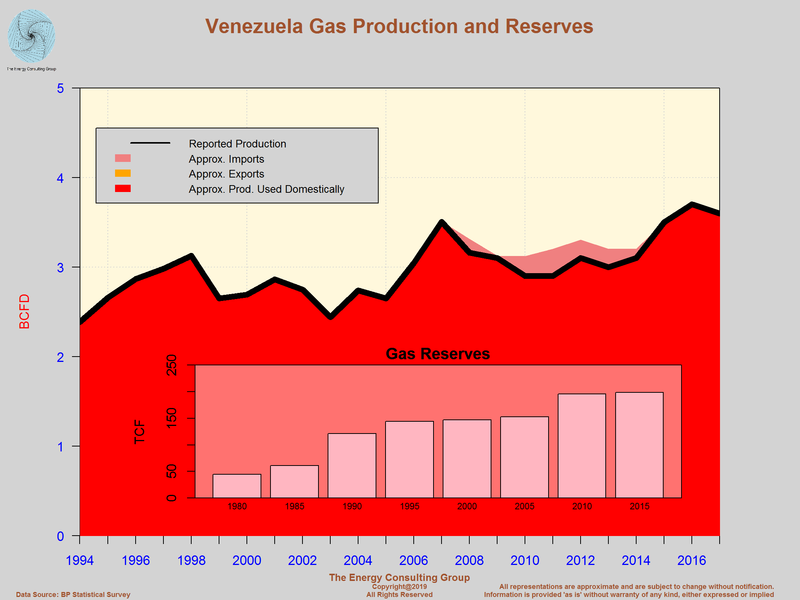 According to OGJ, Venezuela had 196 trillion cubic feet (Tcf) of proved natural gas reserves at the beginning of 2014, the second largest in the Americas behind the United States. In 2012, Venezuela produced 803 billion cubic feet (Bcf) of dry natural gas and consumed 869 Bcf. Since 2003, the petroleum industry has consumed about 40% of Venezuela’s gross natural gas production, primarily for gas reinjection to bolster crude oil extraction. Because of the declining output of mature oil fields, natural gas use for enhanced oil recovery has increased by 42% since 2005. To meet the growing industrial demand for natural gas, Venezuela imports gas from Colombia and the United States. The government has prioritized developing domestic natural gas production for industrial uses as well as residential and commercial markets, and is developing its gas infrastructure in support of this effort. In 1999, Venezuela adopted the Gas Hydrocarbons Law, which was intended to diversify the economy through facilitating non associated natural gas development and expanding the role of natural gas in Venezuela's energy sector. This legislation allows private operators to own 100% of non-associated projects, in contrast to the ownership rules in the oil sector. It also mandates lower royalty and income tax rates on non associated natural gas projects than on oil projects. The law gives PDVSA the right to purchase a 35% stake in any project that moves into commercial status. 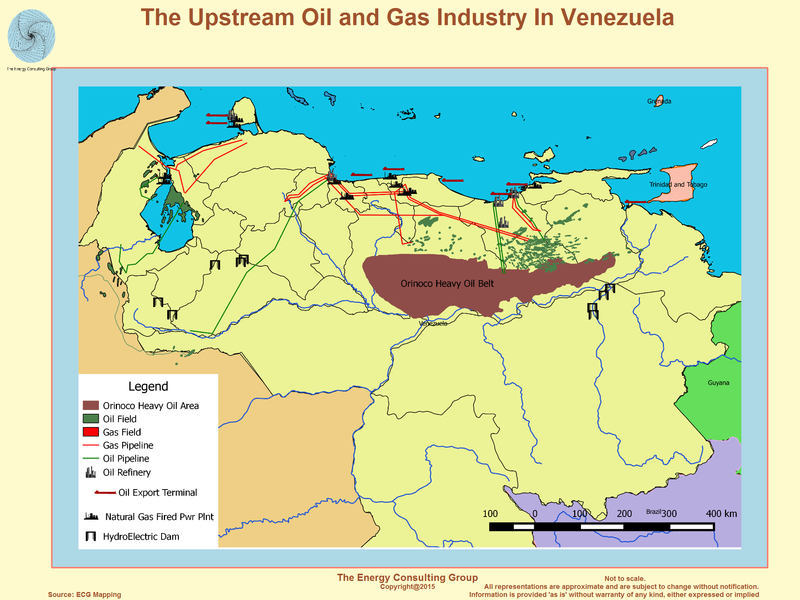 In 2007, Chavez announced a public referendum on proposed constitutional amendments, one of which would entitle the state to a controlling stake in new gas projects, similar to that of the oil sector. However, the Venezuelan people defeated the referendum in December 2007. Since then, the state has yet to repropose amendments to the gas law. About 90% of Venezuela’s natural gas is found associated with oil but the country is looking to locate and produce more natural gas from non associated fields. An estimated 90% of Venezuela’s natural gas reserves are associated, meaning they are located in the same place as oil reserves. Following Chavez’s announcement of the Socialist Gas Revolution in 2009, the Energy and Petroleum Ministry announced plans to increase natural gas production to roughly 14 billion cubic feet per day (Bcf/d) and to begin exporting natural gas by 2015. Currently, Venezuela is working to increase the production of non associated gas, largely through the development of its offshore reserves. Onshore, PDVSA is working toward raising production and capacity at existing sites, including the Anaco field, the Barrancas field, and Yucal Placer. 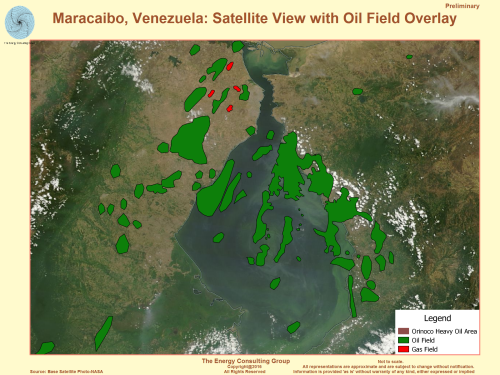 Offshore, PDVSA has awarded exploration blocks to international oil companies, including Total, Statoil, and Chevron, in the Plataforma Deltana, Marsical Sucre, and Blanquilla-Tortuga areas off Venezuela’s northeast coast. Venezuela has also awarded exploratory blocks to Gazprom and Chevron to develop the potential 26 Tcf gas blocks in the Gulf of Venezuela in the northwestern part of the country. Offshore exploration has yielded many successful finds, including Repsol-YPF and ENI’s discovery of 6-8 Tcf of recoverable natural gas in the Cardon IV block in the Gulf of Venezuelaâ€”one of the largest natural gas discoveries in the history of the country. In early 2014, ENI announced gas production would begin in 2015 at their Perla field project with estimated reserves of 15 Tcf of natural gas. 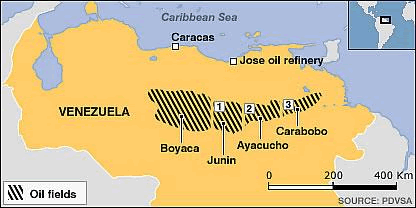 PDVSA had also found a field with a potential 7.7 Tcf gas reserve at Tia Juana Lago in the Sur area. For Venezuela’s offshore gas development to move forward, international partners will need to play a central role in production. PDVSA does not have experience in producing non associated gas—the company’s most recent attempt at operating an offshore natural gas project resulted in the sinking of the Aban Pearl semi-submersible drilling rig in May 2010. In recent years, Venezuela has improved its 2,750-mile domestic natural gas pipeline transport network to allow greater domestic movement and use of natural gas with the roughly 190-mile Interconnection Centro Occidente (ICO) system. The ICO connects the eastern and western parts of the country, making natural gas more easily available for domestic consumers and for reinjection into western oil fields. Expansion efforts to the ICO will increase capacity to 520 million cubic feet per day (MMcf/d). In addition, the 300-mile SinorGas pipeline project will transport gas produced offshore to the domestic pipeline network via Sucre and Anzoategui. In 2008, the Antonio Ricaurte pipeline came online, connecting Venezuela with Colombia. Currently, the pipeline allows Colombia to export natural gas to Venezuela, with contracted volumes ranging between 80 and 150 MMcf/d. While Venezuela planned to eventually export 140 MMcf/d of natural gas to Colombia, difficulties surrounding the development of its resources required Venezuela to continue to import natural gas from Colombia. In September 2008, Venezuela signed initial agreements to create three joint venture companies to pursue liquefied natural gas (LNG) projects along the northern coast of the country. Although PDVSA signed contracts with a number of international investors for these projects, continued negotiations, difficulties, and feedstock concerns are likely to delay its planned 2014 start date. Venezuela depends on hydroelectricity for the bulk of its electricity needs, accounting for 60% or more in the past decade. In 2011, Venezuela had nearly 25 gigawatts of installed generation capacity. The country generated roughly 119 billion kilowatthours of electricity in 2011, 70% from hydroelectric power and the remainder from fossil fuels. 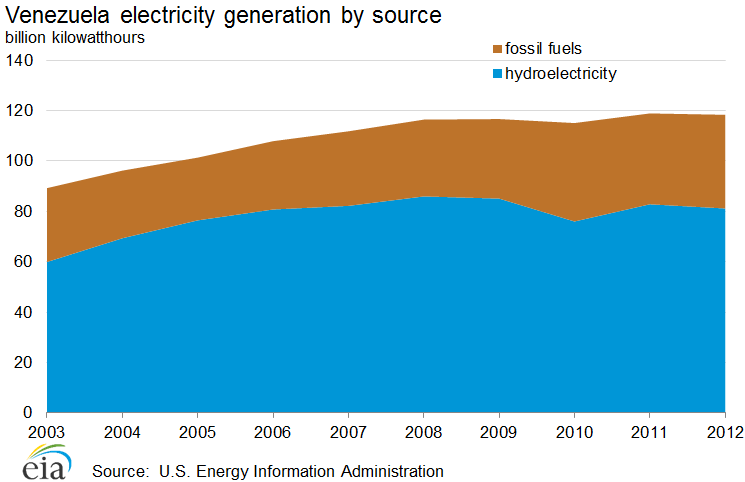 Preliminary estimates indicate that 2012 levels remained the same, with hydroelectric power accounting for 69% and the remaining from fossil fuels. In the past decade, available data show Venezuela’s electricity consumption increased 48% while installed capacity expanded by only 20%, leaving the Venezuelan power grid stretched by the end of that period. A major drought in 2009-10 led President Chavez to declare an "electricity emergency" and led the government to implement painful demand-reduction policies. Large, state-owned companies dominate the electricity sector in Venezuela. The government controls the electricity sector through the National Electricity Corporation (CORPOELEC), a state-owned holding company created in 2007 to consolidate the power sector. CORPOELEC is responsible for the entire electricity supply chain, controlling all major electricity companies in Venezuela including Electrificacion del Caroni (EDELCA), which supplies more than 70% of the country’s electricity. Hydroelectricity provides the bulk of Venezuela’s electricity supply. Most of the country's hydro production facilities are located on the Caroni River in the Guyana region. The 10,200-megawatt Guri hydroelectric power plant on the Caroni is one of the largest hydroelectric dams in the world and provides the majority of Venezuela's electric power. Water levels at the Guri Dam dropped to record-low levels during the 2009-10 drought, forcing the country to implement rolling blackouts, to reduce industrial production, and to fine large users for excessive consumption. Venezuela plans to expand hydroelectric production in the future. About half of the electricity generation from fossil fuels in Venezuela is from natural gas, and the rest is from fuel oil and diesel. There has been increasing investment in conventional fossil fuel generation capacity to reduce reliance on hydropower and use domestic hydrocarbon resources. PDVSA began generating power for its own consumption in 2010 to manage power-supply risks in the oil production sector. Expansion of electricity generation from fuel oil and diesel could further reduce Venezuela’s oil exports. Data presented in the text are the most recent available as of June 20, 2014.